The New York Yankees didn’t have a good weekend, losing two of three to the Baltimore Orioles to begin their 2019 season. Unfortunately, things didn’t get any better on Monday. The Bronx Bombers have placed outfielder Giancarlo Stanton on the 10-day Injured List because of strained biceps in his left arm. He joins a rather crowded Yankees IL less than a week into the season. It’s unclear when Stanton suffered the injury or if it’s something he’s been dealing with all spring. He’s started all three of the team’s games against the Orioles over the weekend, batting third and playing left field in each game. Stanton is 2 for 8 with seven walks in those three games. Both hits were singles, and he’s also been struck out four times. There’s no word from the Yankees on a timeframe for his return. Even if it’s a short-term injury, it’s a bad time for the Yankees to be losing another outfielder. Jacoby Ellsbury has once again started the season on the DL. Aaron Hicks is also on the DL to start the season after dealing with a back issue during spring training. The club can surely get by without Ellsbury, but being without Stanton and Hicks at the same time could be a challenge. Clint Frazier has been called up prior to the start of the triple-A season to take Stanton’s place. The 24-year-old got just 34 big league at-bats last season, in large part because of a concussion that marred his season. He then struggled during spring training, going just 7 for 49. However, he will likely be asked to be the team’s regular left fielder for the time being. Brett Meanwhile, Gardner will remain in center field and Aaron Judge will carry on in right field. New acquisition Mike Tauchman may also get more of an opportunity to play. Of course, with a Frazier-Tauchman platoon, there is likely to be a steep drop-off from the productivity Stanton is capable of providing. If there’s a silver lining, the lack of outfield depth will make it easier for the Yankees to rotate Luke Voit, Greg Bird, and DJ LeMahieu into the DH spot. If he and Hicks were both healthy, Stanton would see plenty of time at DH. However, the Yankees don’t have much choice at the moment but to use their extra infielders in the DH spot. For now, the Yankees can hope that Stanton’s injury is nothing serious. But after a disappointing series over the weekend, they’ll want him back as soon as possible. Despite having plenty of depth, the Yankees will be adversely affected by the no. 3 hitter in their lineup being unavailable. 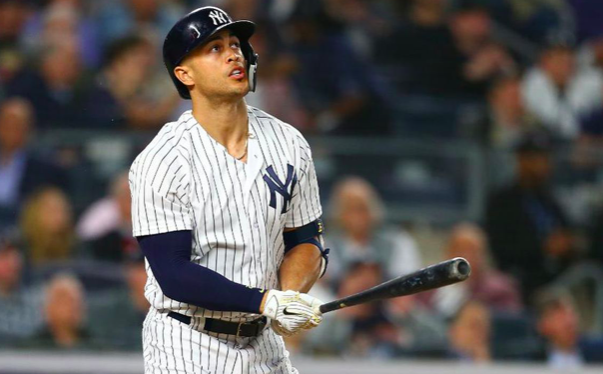 With Stanton joining Hicks, as well as pitcher Luis Severino and Dellin Betances on the IL, the Yankees are at risk for seeing their sluggish start to the season continue.